The narrative we hear so much is that professionals in primary care are disenfranchised, burnt out and leaving the profession – and the terrain is tough right now. Despite this I met so many inspiring colleagues that I felt their stories, challenges and passions needed to be visible (and audible!) to show colleagues that there are great things happening too. 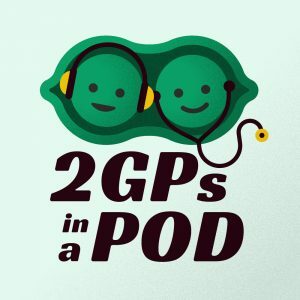 That’s why I created 2 GPs in a Pod – a podcast means hearing these stories in a way that doesn’t feel like ‘work’ – more like a great conversation at the pub. A good way to think outside the box, hear about what colleagues have overcome, and just opening out our minds a bit to feel connected beyond our local “bubbles” – on your commute, while you cook or do your paperwork. It’s amazing to see the breadth of what we are able to do in Primary care – from Partners creating Community enterprises to expedition medics and so much more. I have had some truly remarkable guests with amazing stories, and have some awesome ones in the pipeline.